This "Historically Speaking" column was published by the Exeter News-Letter on June 3, 2016. Often when people visit the Exeter Historical Society, the interior woodwork becomes as much a conversation topic as the history of the town. The striking quarter sawn oak, has aged to a dignified dark honey color. The oak is so hard that it is impossible to even push a thumb tack into it. In 2015, when the floors in several of the rooms were refinished, the workmen took time out to take photographs of the walls. Yes, they wanted pictures of woodwork. This woodwork is art. The building was originally the Exeter Public Library. Built in 1894, it also served as the Civil War monument, which is why the names of Exeter’s Civil War servicemen are carved on tablets by the front door. Although designed by the Boston firm of Rotch & Tilden, the contract for the interior woodwork went to a long established Exeter firm called Brown & Warren. Of the buildings mentioned, only a few still exist. 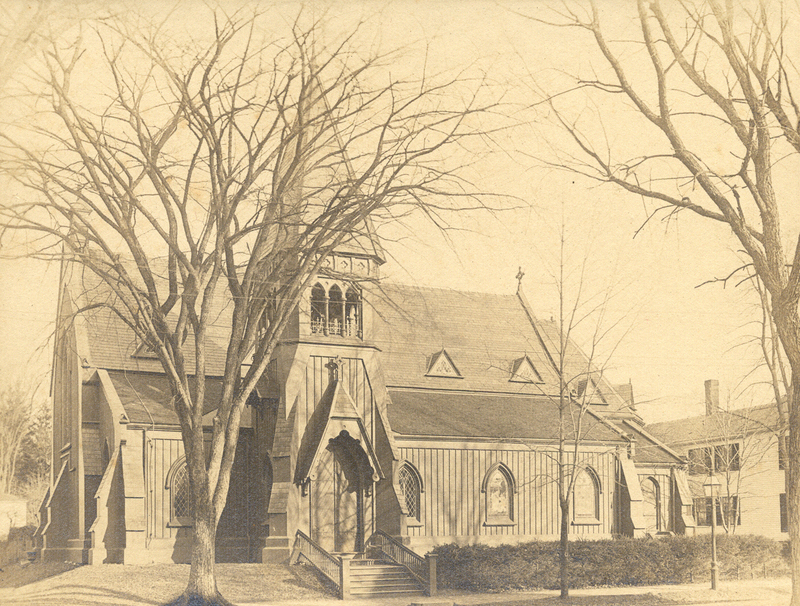 Christ Church Episcopal, once located on Elliot Street, was razed in 1965. A visit to the chapel, preserved in the new church building on Pine Street, can provide a feel for the work of Brown & Warren. The Unitarian Society, of which both Brown and Warren were members, was taken down in 1944 when wartime coal shortages convinced the congregation that the large building was not cost effective. The parishioners moved into their assembly hall, called Unity Hall and converted it into the new sanctuary. Unity Hall was also built by Brown & Warren. In its original form, it had had the same open frame construction with a hint of gothic. 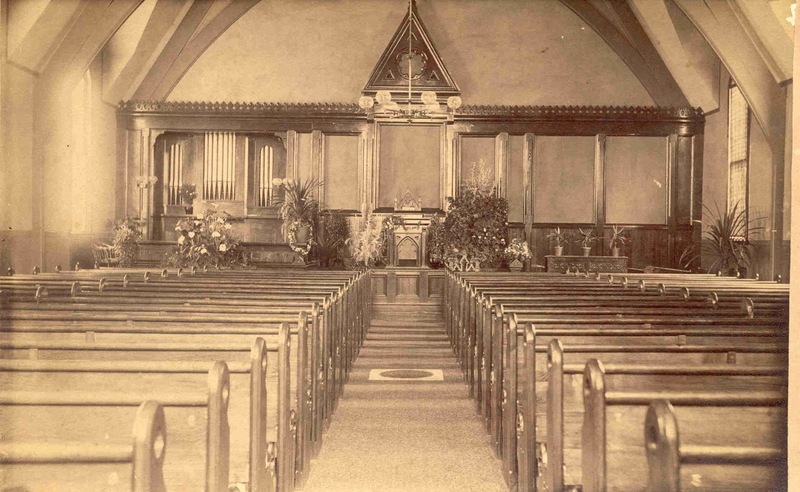 Today, the only remains of Brown & Warren’s design in the First Unitarian Universalist Society are the pews. The elegant timbers of the original ceiling are covered with drop acoustic tiles. The Rockingham County Courthouse featured interior woodwork by Brown & Warren, but it was torn down in 1969. The wood in the Exeter town hall was, at some point, painted – covering any of the features of the original that might still exist. Even some of the wood at the Exeter Historical Society succumbed to the painting fad of the post-war period. The dark tones of the wainscoting were deemed ‘stuffy’ in an era that longed for bright colors and clean optics. In our main meeting hall, if you look closely, the wainscoting has been painted and faux woodgrain applied during the 1988 renovations. To get the best view of the quality of work the firm was famous for, a visit to the First Baptist Church on Front Street is necessary. Stop by sometime when the sanctuary is open to really look at a Brown & Warren building. At one time the firm had over 20 skilled carpenters on staff. The two men were alike in more than just their vocation. They belonged to the same town organizations: the Friendship Council, The Knights of the Royal Arcanum; both were active Republicans and both were part of the Exeter Fire Department – even serving as the chief engineer. Brown was fire chief in the 1870s, when the department took a technological leap forward with the purchase of the Eagle Steamer engine. Warren was so beloved as chief that hose company #2 was named the “Charles E. Warren Hose Company” in his honor – while he was still in it. Together they bought a duplex on Pine Street, renovated the interior and lived side by side to raise their families. The partnership continued until 1894, when John Brown became ill with Bright’s disease. His death two years later at the age of 66 was a loss to his partner. Charles Warren continued to be active in town affairs, adding an interest in the sewer system to his resume. Warren’s obituary, in 1903, is so similar to his partner’s that it is easy to confuse them. Even the funerals were the same – held at their joint residence on Pine Street in mid-afternoon, Unitarian minister Reverend Edward Green presided at both. Perhaps the art of great carpentry is that same seamlessness that came naturally to the two men. Slight variations of grain form the brushstrokes that they set into the walls, doorways and arches of their buildings. Photos: Detail of woodwork in the research library of the Exeter Historical Society, formerly the Exeter Public Library. 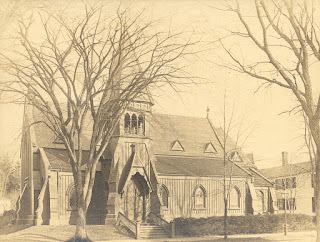 Exterior of Christ Church Episcopal c. 1890, Elliot Street – also built in 1867 by Brown & Warren. Razed in 1965. Interior of the First Unitarian Society of Exeter c. 1890, corner of Elm and Maple Streets – built in 1867 by the firm of Brown & Warren of Exeter. Razed in 1944.